I have a confession, I used to be a fan many years ago of the “garden burger”. Remember those frozen patties in the green boxes? Yep, those ones…I used to love those. The garden burger craze…that was a funny one! As I’ve grown older and much wiser, I eat a lot less processed food too, and have found my culinary palette that had not existed before. Gone are those days of frozen boxes, drive thru foods ( unless we’re talking about a Dutch Bros latte)! Here are the days when I love to create new things in the kitchen, healthy, and some not so healthy…gotta have a balance right? 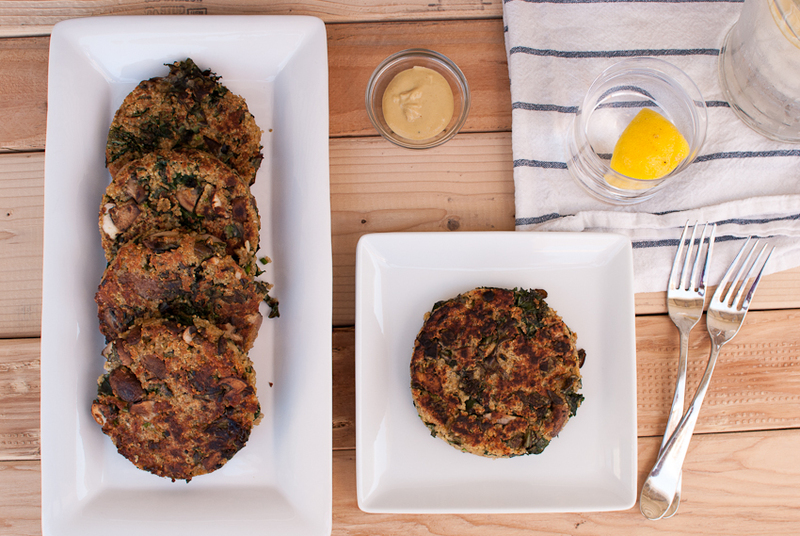 Quinoa, Kale, and Mushrooms, the top three stars in these patties… so easy to make, and they freeze well too! The mushrooms gives these burgers a “meaty flavor” without the meat. Andrew, the meat connoisseur in our house, eats these every time I make them and says they taste awesome! 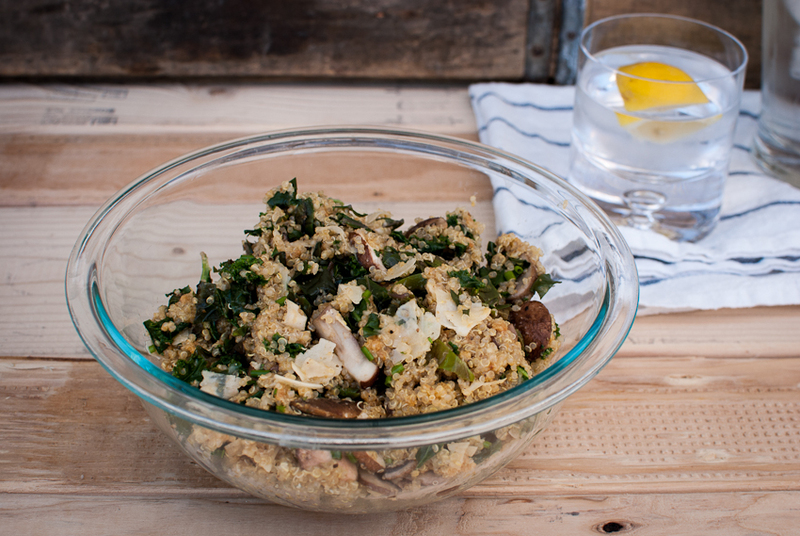 The bright green Kale adds some color and texture while the quinoa acts as a binder and protein. I like to serve mine without the bun and some dijon mustard on the side. The bun is not missed, these burgers are filling on their own! Almost anything would taste great on these….avocado, tomato, onions, pickles…make it your own burger. I do not recommend grilling these on the outdoor grill though…they are a bit fragile and would probably fall right through the grates. I do have a hamburger press that I use to get that even round shape. No fear, if you do not have one, just scoop about 1/4 cup of the mixture into your hands and roll into a ball, then press lightly into the pan. Put sliced onions and garlic in a medium pan and sautee with oil until lightly brown, then add mushrooms for 5-7 minutes until cooked, remove from heat and cool. In a large bowl, mix all the ingredients above together except the oil. Make sure the onion mixture is cool before adding to the mix. Heat a large skillet over medium heat with olive oil or cooking spray. 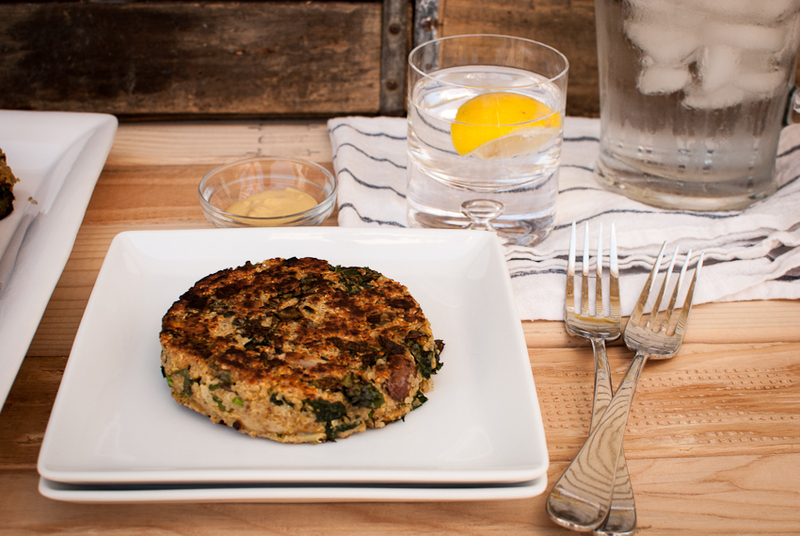 Cook for 8-10 minutes per side, depending on how large your patties are, they could take less time to cook. Note~ Make sure your skillet stays well oiled or the quinoa will stick to it. These look super yummy! I am going to try them this weekend! This look so good. And, I used to be a huge fan of the old-school black bean burger. I think this would be even more delicious. Used chickpea liquid instead of eggs and vegan parmesan cheese!